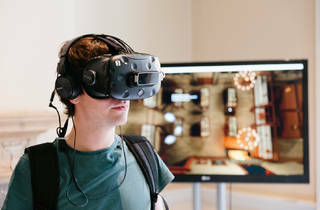 The latest in an ever-growing number of artists to try their hand at VR technology, Collishaw has recreated one the earliest ever photography exhibitions – when pioneer William Henry Fox Talbot presented some of his pictures at a school in Birmingham in 1839. Visitors can become fully immersed in this portal to the past and walk freely about the digitally reconstructed room. Appearing as ghostly figures to other visitors, you can touch bespoke vitrines and fixtures, interact with objects on display, hear rioters outside and even feel the warmth of an open fire. Spooktacular. Find out more here. Having never really considered VR before (I am definitely a slow-adopter of new technology), my original motivation to see this installation was its link with William Henry Fox Talbot, one of the founding fathers of photography and the installation's creator Mat Collishaw, whose wonderful work I saw recently at a private gallery. Once signed up though, I was really excited about the new technology and how it would work. I was not disappointed. The idea that you can walk into a room that is a complete blank canvas, yet experience a whole new world, simply by putting on a pair of 'goggles' is really something else. The technology itself was a little glitchy (I had to have my headset replaced as it kept cutting out, and my second set wasn't quite syncing correctly, so I walked into a cabinet, which appeared much further away, much to the amusement of my companion watching from outside) but that was forgivable as it was the last day and the machines were probably 'tired'. It was also smaller than I had expected - we were only in there for 6 minutes. But it was still a fantastic experience and a great chance to tap into something I'd never seen before. I loved the fact that they decided to use this super futuristic technology to step right back into the past. I thought that was pretty clever and a wonderful way to blend the future of visual technology with its origins. I am quite excited to see what will happen in the future with this technology now and I suspect Somerset House, having done this for the very first time, will produce something even more interesting with it at some point over the next few years. For now, I shall continue to be in love with vintage photography but perhaps consider a different way of seeing as a possibility as well. I suspect that's what Henry Fox Talbot, being an innovator, would have done. With only juts under 2 weeks to go, I would defiantly encourage anyone who is reading this to buy your ticket - they are cheap at only £4.50. 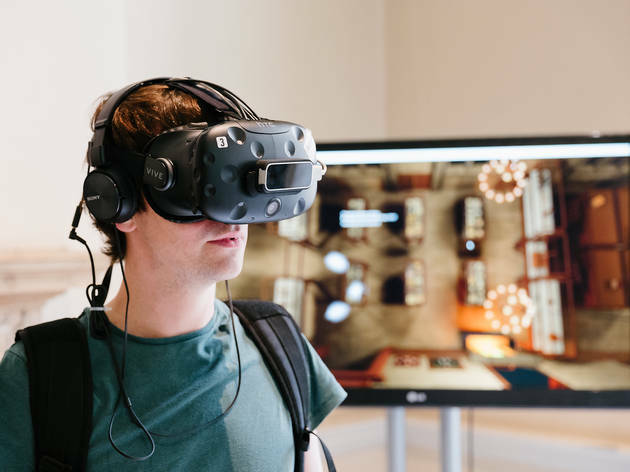 This exhibition is a really interesting idea, combining augmented reality and virtual reality to recreate the first ever photography exhibition in the world from 1839. When you arrive you are given a briefing, while you wait and are able to watch other people through a window. The room is a clean while replica of the virtual room you will be standing in, with all the furniture and display cases included in white. You wear a backpack, earphones and an Oculus VR head set to walk around in this space. The attention to detail is amazing, with an electric heater pumping out heat near the virtual fireplace. and the ability to feel the bars across the window and things happening outside. There were a couple technical hiccups initially, but overall it was a really cool exhibition and the tech worked surprisingly well. You can see other people as disembodied white ghost like figures moving around the space so you don't bump into anyone and (if it works) you can use your hand to 'pick up' and look closer at the exhibition photos.